THE PURPOSE OF THIS MESSAGE IS TO MODIFY THE EXISTING WEAR POLICY FOR THE (IPFU). THERE ARE A VARIETY OF MINIMALIST RUNNING SHOES AVAILABLE FOR PURCHASE AND WEAR. EFFECTIVE IMMEDIATELY, ONLY THOSE SHOES THAT ACCOMMODATE ALL FIVE TOES IN ONE COMPARTMENT ARE AUTHORIZED FOR WEAR. THOSE SHOES THAT FEATURE FIVE SEPARATE, INDIVIDUAL COMPARTMENTS FOR THE TOES, DETRACT FROM A PROFESSIONAL MILITARY IMAGE AND ARE PROHIBITED FOR WEAR WITH THE IPFU OR WHEN CONDUCTING PHYSICAL TRAINING IN MILITARY FORMATION. Interesting. 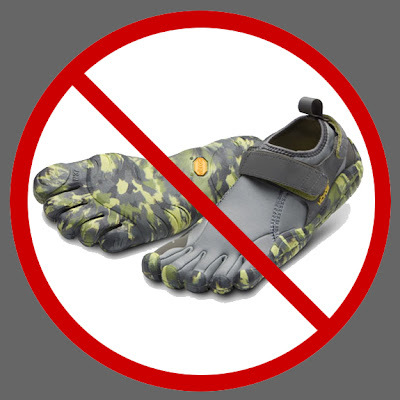 Sounds like the Army thinks that splay-toed footwear is so ugly that it can't be worn even for PT. 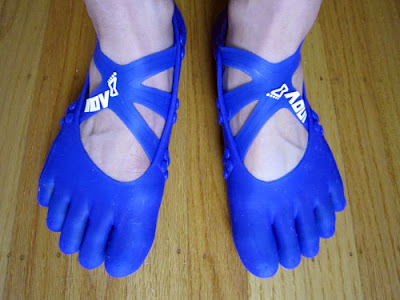 Okay -- I'll admit that certain models of Vibram FiveFingers are ridiculously garish, and I can see why the Army (which has a pretty tight dress code as it is) would barf all over have an issue with soldiers who look like they dipped their feet in fluorescent paint. 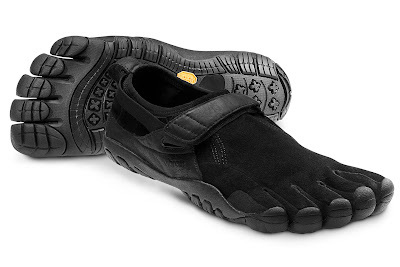 But on the flip side, FiveFingers are a helluva lot better for our soldiers' feet than stiff, thick-heeled combat boots. The Army, I think, gets this -- after all, they've seen the benefits of proper running mechanics, and in the ALARACT itself, they explicitly call out the "variety of minimalist running shoes" available to soldiers and civilians alike.